Earnings season is nearly here, and solar manufacturers could blow expectations out of the water. Earnings season is nearly here in the solar industry, and the stakes are high for solar investors. 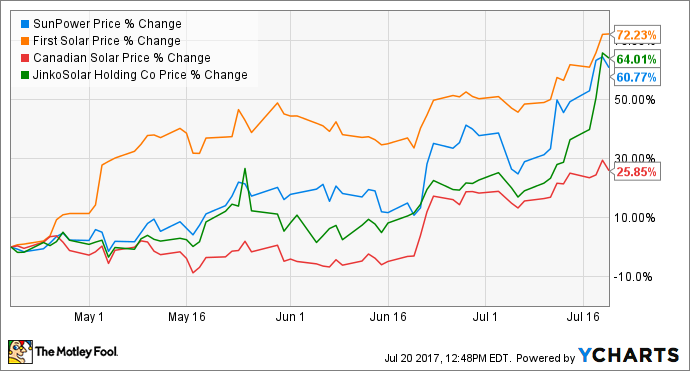 SunPower Corporation (NASDAQ:SPWR), First Solar, Inc. (NASDAQ:FSLR), JinkoSolar Holding Co. (NYSE:JKS), and Canadian Solar Inc. (NASDAQ:CSIQ) have all surged in the last three months as investors have gotten bullish on solar earnings. There's even a possibility these stocks have further to run. I think the evidence is mounting that solar stocks will crush expectations this earnings season. There's a lot of evidence recently that the second quarter -- and potentially third quarter -- of 2017 will see much higher solar demand than anyone expected. China's policies have led to a surge in installations, and the Suniva trade case making its way through the U.S. government is causing developers to push up their own construction and purchasing time lines. This has two impacts on solar-panel manufacturers. The first is that panel prices go up short term. There have been reports that prices are up on the spot market -- and that would help all solar manufacturers. Axiom's Gordon Johnson has also reported that he believes First Solar is selling panels at $0.50 to $0.60 per watt, a notable jump from commodity panels selling for $0.35 to $0.40 per watt at the end of 2016. Higher prices would definitely lead to higher margins for those who have capacity that's not already sold out. Not only are panels being sold for more than expected, but I think we'll see some manufacturers delay manufacturing shutdowns and produce more panels in 2017 than they expected. First Solar and SunPower are shutting down or upgrading their manufacturing lines, and anything they can keep running to take advantage of the current pricing environment would be a positive. Canadian Solar and JinkoSolar may even be at higher utilization rates than they expected. Combine the increased prices and volumes and we could have huge earnings beats on the bottom line. And most analysts haven't increased expectations, so investors may still be surprised how good the results are. The Suniva trade case is one of the short-term drivers of rising prices and demand. But long term, it's a thorn in the industry's side. Chinese manufacturers, like Canadian Solar and JinkoSolar, could be essentially shut out of the U.S. market if the $0.78 per-watt price floor on panels Suniva has asked for is put in place. There's almost no scenario where the trade tariff would be a positive for manufacturers in China. U.S. manufacturers could see a benefit, depending on what the tariff ends up looking like. First Solar has a manufacturing plant here that it could use to fill U.S. demand, but most of its manufacturing is in Asia. SunPower has a pilot line in the U.S. and a plant in Mexico, but it also manufactures most of its panels in Asia. The one advantage for SunPower is that a per-watt price floor would tend to favor its high-efficiency modules, which could lead to a windfall, depending on the final ruling. In other words, great results from solar manufacturers in the next two quarterly reports could be followed by a much weaker end to 2017 and early 2018, depending on the Suniva trade case. The fact that solar manufacturers are likely to have fairly good results for the second, and maybe third, quarters is in sharp contrast to what I've called an abyss in the demand the industry expected in 2017. Manufacturers were just hoping to make it through 2017 to reach a more stable solar market in 2018 and beyond. But 2017 could be a profitable year, with global growth still expected to follow in coming years. As much as solar manufacturers have recovered in the last few months, there's still further room to run. I'm staying bullish on the solar industry.